Beginning October 1, 2005, the James Cohan Gallery will present Mobility, an exhibition devoted to new works by the British artist Yinka Shonibare. The exhibition runs through October 29. This exhibition coincides with an installation by Shonibare at the Cooper-Hewitt, National Design Museum in New York, which opens to the public on October 7. The show consists of one installation as well as three large sculptures, and a new body of paintings all related to the theme of mobility. The installation is titled Reverend on Ice; it is one room of the gallery transformed into a frozen pond, a headless figure dressed in African cloth glides on the snow-covered ice. The work is directly inspired by Sir Henry Raeburn's paintingReverend Robert Walker Skating on Duddingston Loch (1795). The Raeburn painting, which hangs in the National Gallery of Scotland, presents a man poised between rectitude and release, with the pious reverend of the title extending his leg in a balletic swoop. Shonibare was attracted to the multiple incongruities in this image, conflating the disparate worlds of Europe and Africa as well as the sacred and joyously profane. In the main gallery, Shonibare's three large sculptures confront colonialism and class with a playful, humorous, and sardonic vision. 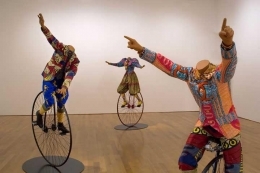 His signature headless Victorian characters, wearing nineteenth century aristocratic clothes made of African textiles, depict a man, woman, and child riding unicycles. Each character is in a different state ranging from highly controlled to reckless. Through the use of subtle detail, Shonibare suggests notions of upward or downward mobility in collision with colonial and capitalist activities. The fabrics Shonibare uses in his work are assumed to be indigenous African cloth. However, they are designed by the Dutch and imported into Africa after the intended Indonesian market rejected them. 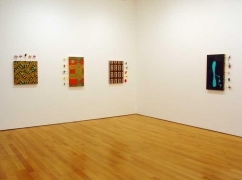 The paintings featured in the third gallery are spontaneous responses to the "African" fabrics used as canvas. Shonibare calls them "toy paintings." They reference various painting movements such as abstract expressionism and fauvism. 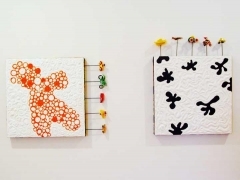 The paintings have toys directly affixed to them such as cars, planes, flying insects and boats. They can be hung in any direction, further suggesting symbolic notions of mobility. Yinka Shonibare (b.1962) is a painter, photographer, and installation artist. His art is influenced by both the cultures of Nigeria, where he grew up, and England, where he studied and now lives. He has exhibited widely throughout the world, and was shortlisted for the prestigious Turner Prize in 2004.